In a sign of the strong influence that Paul and Romero had on the first Latin American pope, Francis wore the blood-stained rope belt that Romero wore when he was gunned down by right-wing death squads in 1980. Pope Francis has praised two towering figures of the 20th-century Catholic Church as prophets who shunned wealth and looked out for the poor as he made saints of Pope Paul VI and martyred Salvadoran Archbishop Óscar Romero. 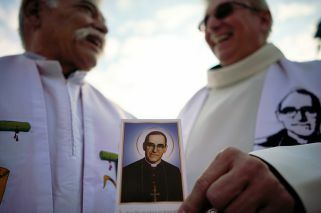 Francis canonised two men at a Mass in St. Peter's Square on Sunday before some 70,000 faithful, a handful of presidents and 5,000 Salvadoran pilgrims who travelled to Rome to honour a man considered a hero to many Latin Americans. Tens of thousands more Salvadorans stayed up all night at home to watch the Mass on giant TV screens outside the San Salvador cathedral where Romero's remains are entombed. In a sign of the strong influence that Paul and Romero had on the first Latin American pope, Francis wore the blood-stained rope belt that Romero wore when he was gunned down by right-wing death squads in 1980, and also used Paul's staff, chalice and pallium vestment. Paul, who was pope from 1963-1978, presided over the modernising yet polarising Church reforms of the 1960s. He was the pope of Francis' formative years as a young priest in Argentina and was instrumental in giving rise to the Latin American Church's "preferential option for the poor" that Francis has made his own. Francis also has a close personal connection to Romero, and like him lived through the terror of right-wing military dictatorships when Francis was in Argentina. Francis was responsible for eventually declaring Romero a martyr for his fearless denunciations of the military oppression at the start of El Salvador's 1980-1992 civil war. "The love of money is the root of all evils," he said. "Where money is at the centre, there is no room for God or for man." For many Salvadorans, it was the culmination of a fraught, politicised campaign to have the Church formally honour a man who spoke out for the rights of landless peasants and the poor at a time when the US-backed right-wing government was seeking to quash a leftist rebellion. "We couldn't stay home on this historic day," said José Martínez, who with his wife and two young children joined the crowds outside the San Salvador cathedral. "I want my children to know Monsignor, our saint, that he was a great man who raised his voice to defend his pueblo, and for that they killed him." But his popularity with the left led to a decades-long delay in his saint-making cause at the Vatican, where right-wing cardinals led by Colombian Cardinal Alfonso López Trujillo warned that his elevation would embolden Marxist revolutionaries. Romero's influence continues to resonate with El Salvador's youth as the country endures brutal gang violence that has made the Central American nation one of the world's most violent. "He is my guide, and from what I have read about his life, I want to follow in his steps," said Óscar Orellana, a 15-year-old who joined the San Salvador procession wearing a white tunic like the one Romero used to wear. Paul is also remembered for his two most important encyclicals, or teaching documents, which have had a profound effect on the Church: one denounced the mounting inequality between rich and poor, and the other reaffirmed the Catholic Church's opposition to artificial contraception. Paul is also very important to Emeritus Pope Benedict XVI, whom Paul made a cardinal in 1977. Officials said the 91-year-old Benedict was too weak to attend Sunday's canonisation, so Francis paid him a visit on the eve of the Mass.